Li, Zhi, et al. "Development of an architecturally comprehensive database of forearm flexors and extensors from a single cadaveric specimen." Computer Methods in Biomechanics and Biomedical Engineering: Imaging & Visualization 3.1 (2015): 3-12. Technology has markedly improved the data that are used to generate musculoskeletal models; however, the need for more detailed musculotendinous architectural data persists. To address this need, we have digitized three-dimensional (3D) coordinate data of the fibre bundles (FBs) throughout the volumes of all 20 forearm muscles to generate a comprehensive database of the musculotendinous anatomy. 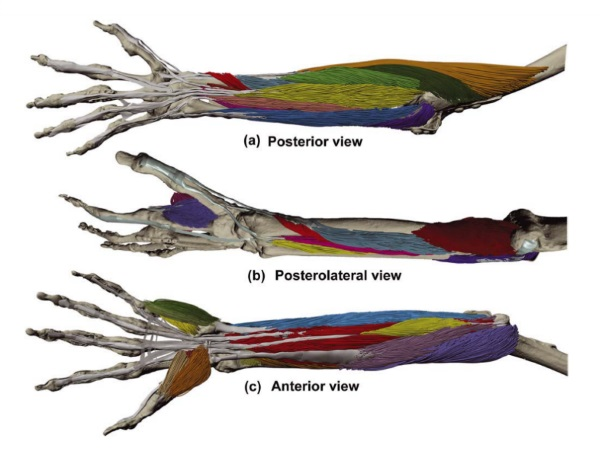 The computerized reconstruction of the forearm anatomy enabled us to quantify muscle architectural parameters, as well as to visually examine the intricate spatial relationships between muscles and the 3D arrangement of FBs relative to their tendons and the underlying skeleton. The muscles of the forearm exhibited a wide range of architectural variation that we quantified using 3D geometric principles. This database improves upon that of previous studies and facilitates more detailed description of the muscle architecture in a format that can be used to inform and advance the development of state-of-the-art dynamic models for biomechanical simulations.